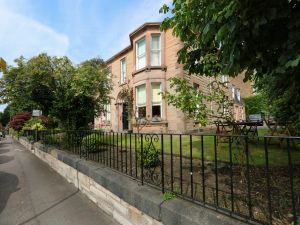 Ard-Na-Said, one of Edinburgh's best bed and breakfasts with free parking, is located in the peaceful Newington area on the south side of the city centre. It is near to Holyrood Park, and within walking distance of the city’s attractions and restaurants. Ard-Na-Said Guest house is certainly the ideal location to enjoy all that Edinburgh has to offer and still be able to retreat from the hustle and bustle of the city centre. Built on the Prestonfield estate in 1876, our detached Victorian villa has many original features such as high ceilings, ornate cornicing, stained glass windows and original Victorian geometric floor tiles. Finally, if you just want to unwind in your room at the end of a busy day in the city centre, sit back and enjoy our newly installed Freeview TV offering 60 different channels. Furthermore, most of our rooms now have Smart TVs. Perfectly located for Edinburgh University, Pollock Halls, Kings Buildings, Prestonfield House, “Taste of Scotland”, Royal Commonwealth Pool, Holyrood Park, Arthur’s Seat, Edinburgh Royal Infirmary, Edinburgh Military Tattoo.